Justin Williams will try to keep his goal and point streaks alive when the Carolina Hurricanes go for their third consecutive win and eighth in nine games since Dec. 31 against the New York Rangers at Madison Square Garden on Tuesday. Williams has seven points (six goals, one assist) during his seven-game point streak, including goals in five in a row. He's the sixth player in NHL history to have a goal streak of five games or longer after his 37th birthday, joining Brett Hull, Johnny Bucyk, Gordie Howe, Phil Esposito and Daniel Sedin. The Hurricanes are within five points of the second wild card into the Stanley Cup Playoffs from the Eastern Conference. They have lost 15 straight games (0-12-3) at Madison Square Garden since Jan. 5, 2011 while being outscored 52-20. The Rangers have lost six of their past seven games (1-6-0). They've also lost four straight at home, where they are 1-2-5 since Dec. 2. Hurricanes forward Sebastian Aho has scored five goals in his past two games, including a hat trick against the Nashville Predators on Sunday. Rangers forward Mats Zuccarello has scored three goals in his past two games. Lindgren will make his NHL debut after getting called up from Hartford of the American Hockey League on Monday. 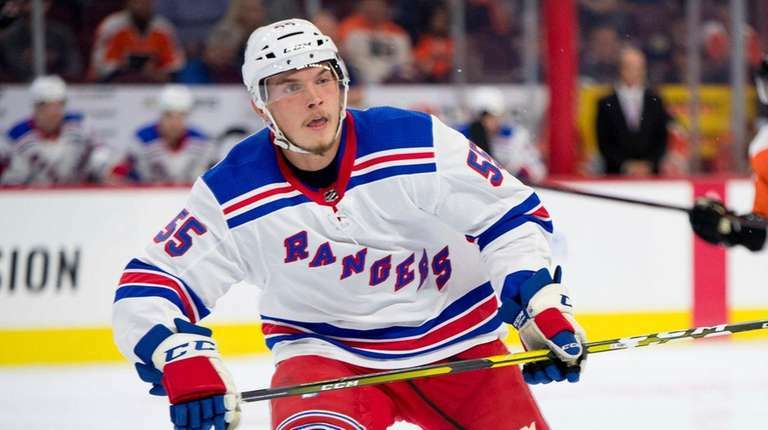 … Quinn said Claesson will be out 2-3 weeks and Pionk is not expected to play until after the All-Star break. … Hayes will miss his sixth consecutive game. Faulk is two points from passing Dave Babych (240) for most by a defenseman in Hurricanes/Hartford Whalers history. … Lundqvist has allowed 15 goals on 70 shots (.786 save percentage) in his past three starts. Location: USA That will be a very fast game and it will be very slippery. As usual Fast arse will get the treatment while falling on the ice or someone’s laps. Location: USA That night should been better with the Islanders,more appropriate with a logo of a Fisherman on their jerseys. Lindgren having to carry Shattenkirk on his first night just ain't right. Staal what a stupid play, totally his fault. Dumb dumb dumb pass. Location: 17 miles from MSG Staal hung Howden out to dry on that one. Location: AV is gone Is there a Plan for that type of play? like a Plan A assist? Location: 17 miles from MSG McQuaid setting the standard for toughness. Is there a Plan for that type of play? like a Plan A assist? I think the plan was A, but the pass went too far. Kreider showed some brain power by adjusting. McIhinney should have read Kreider and stayed in the crease. Perfectly executed dump in. One of many planned ones I hope. He is hard to stop when he comes to play, problem is it is not 82 games. He forgets who he is, although it seems less this season. He still get screwed when he drops a guy with a hard hit. Location: NJ This Aho is turning into a real player.